Prepping the Canon Cinema EOS C100 Mark II. The intuitive menu, ergonomic design, intelligent array of physical buttons, the compact and lightweight battery system, the practical and utilitarian handle with XLR inputs, the vast array of usable ISO’s and the built in ND filters make the camera a pleasure to work with. The built in AVCHD recording is elegant and inexpensive. I use 16GB cards costing $17 each that record about 88 minutes of footage and I never wipe them. I file full cards away — the same way I archived the camera negative when I shot motion picture film back in the day. Beyond that, setting up an external ProRes recorder via HDMI is easy. On top of that, it’s a solid piece of engineering. I’ve never encountered a systemic failure or any real problems. I keep the camera built with a matte-box and follow focus as pictured below (alongside the Mark II) in a bag that’s wide enough to accommodate the rig so that I can have it out of the bag and set up quickly. Left: the original C100. 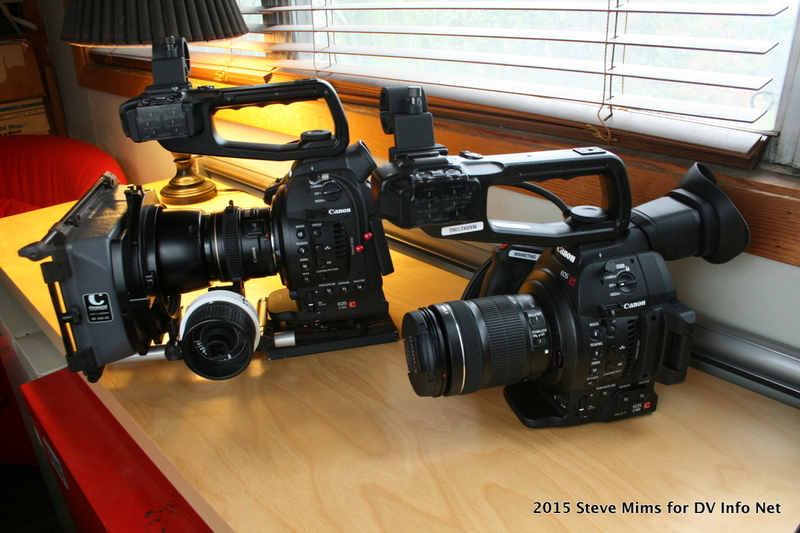 Right: the new C100 Mark II. My editorial workflow begins with converting the camera files to QuickTime ProRes (HQ) and editing in Final Cut Pro 7. I shoot everything in C-log mode and do my color correction with Tiffen DFX. I love it, and I have a customized version of their Kodachrome film stock setting that is my favorite look. Long story short, I was comfortable and happy with the way I worked with the C100. Until last week. Now I think I need a Mark II. Really. The physical, assignable buttons, viewfinder and OLED screen, all placed conveniently and logically, make operating the camera a pleasure. The Canon C100 Mark II improves the camera in every area and adds many new features. Here I’m limiting my comments here to the modifications that are most important to me: the replacement for the viewfinder, the new OLED adjustable screen with menu control built in, improved signal processing and brief notes on a couple of new lenses. Beyond that the footage itself provides more information. Marek Mlocek, Katherine Horak, and Katherine Williams. the left you can see the a Lowell DP light bounced into foam core. Molly Flynn under the Lowell Pro light. 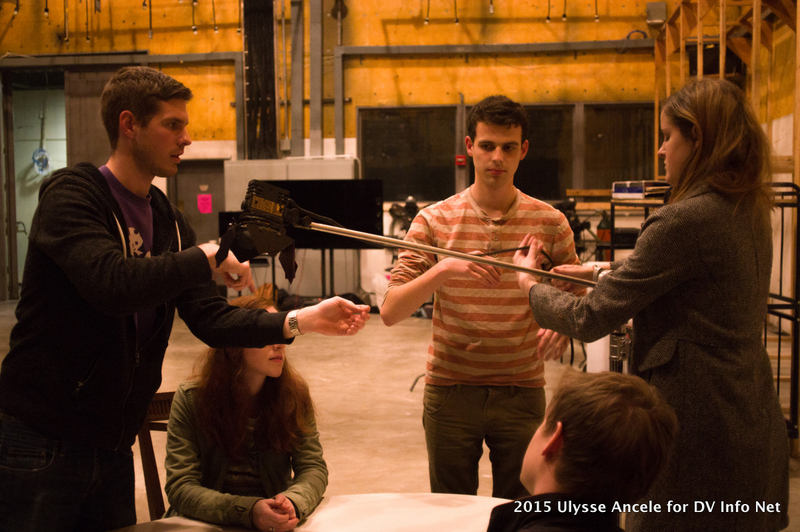 Paul Judah, Seth Beaugh and Katherine Horak set up a 250 watt Lowell Pro on a grip arm in the studio. 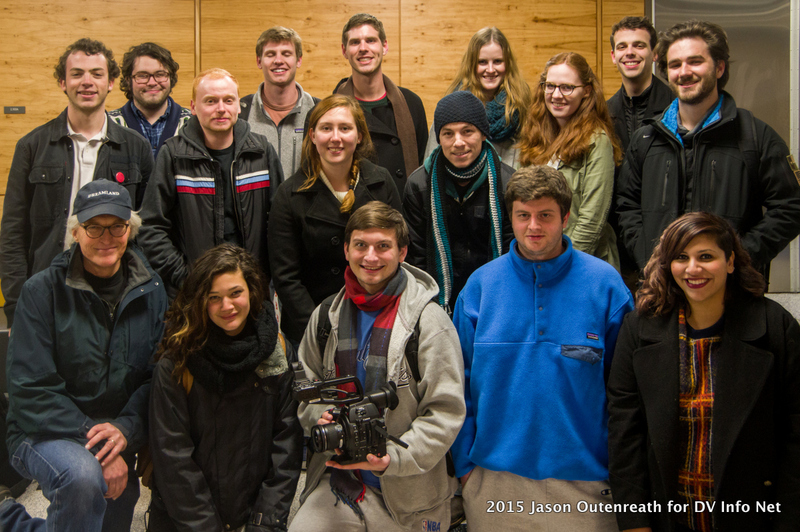 I recently got to shoot with the camera along with my students at the University of Texas at Austin. 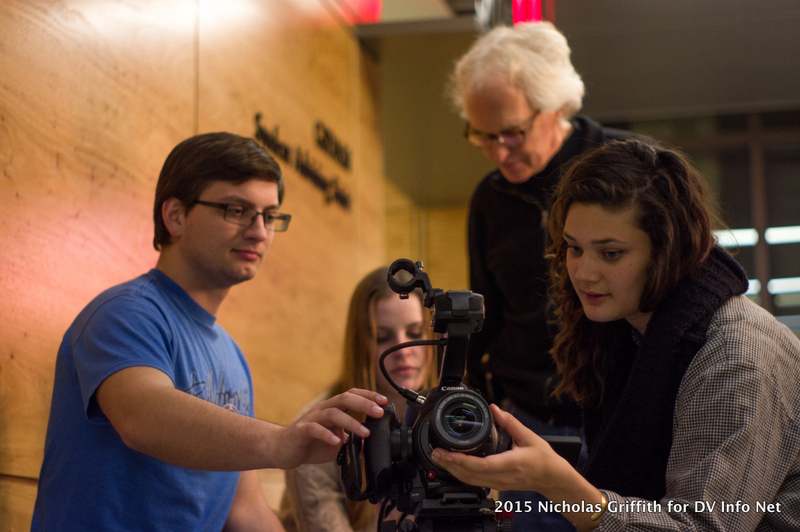 We shot during lab sessions in the studio, in the lobby and outside of of UT’s Belo Center for New Media. 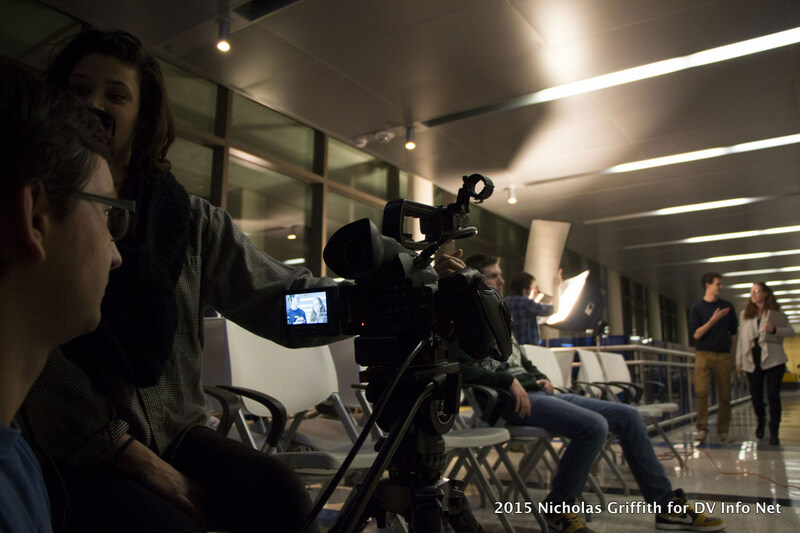 In the studio we shot at ISO 850, in the lobby we used ISO 8000 and for the night exterior we set the ISO to 2500. It all looks very good. You’ll see some noise/grain in the ISO 8000 footage of course, but it’s not unlike film grain. The video clip includes two passes of all shots: the uncorrected C-Log first, followed by a timed version. All footage was shot at 23.98 fps with a shutter speed of 1/48th of a second. We used my Canon EF 70-200mm f/4L and EF 85mm f/1.8 lenses and we also tried out a couple of new Canon lenses… the Canon EF-S 10-18mm ultra-wide IS STM and the Canon EF 24-105mm IS STM (all noted in the footage). 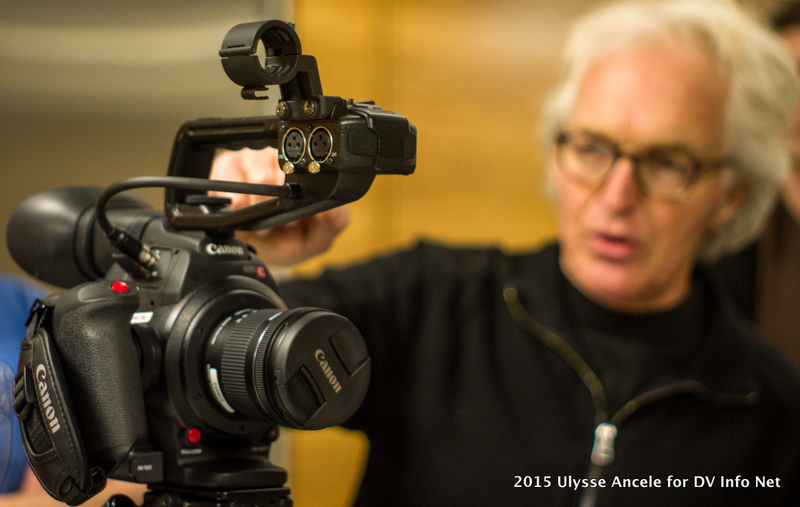 We shot with the C100 Mark II during two labs. Frame rate: 23.89, shutter: 1/48, file: AVCHD at 24mbps, converted to QuickTime ProRes (HQ). 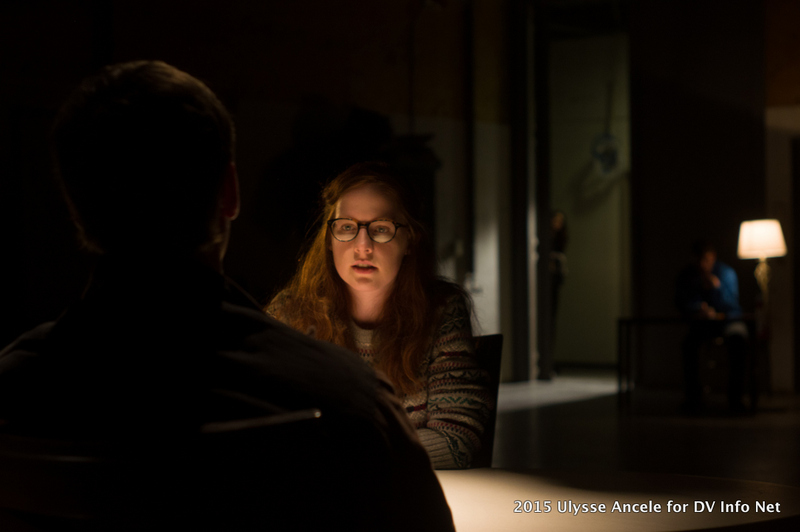 In our STUDIO TEST, we set up and lit a simple scene and kept the ISO at 850. We used two lenses: an EF 24-105mm f/3.5-5.6 IS STM and the EF 85mm at f/1.8 (we had to dial in an ND filter to keep the exposure wide open). We basically had an empty studio with no flats to work with, so we opted to keep most of the room dark. We suspended a 250 watt Lowell Pro from a c-stand over the table, used a 250 Watt Mole Richardson Midget with a snoot and amber gel for a kicker, bounced a 1k into gold foil for a wash on the studio wall and backlit the hallway with an Arri 650. Our talent: Molly Flynn and Pat Murphy, wrote their dialogue in about fifteen minutes, and, I think, acquit themselves nicely in a performance for the ages. In our HIGH ISO TEST, we filmed in the lobby and exterior courtyard of the University’s Belo Center for New Media primarily in existing light. We did fill one interior set up with a 1k Lowell DP diffused through a Chimera soft-box and bounced on foam core. 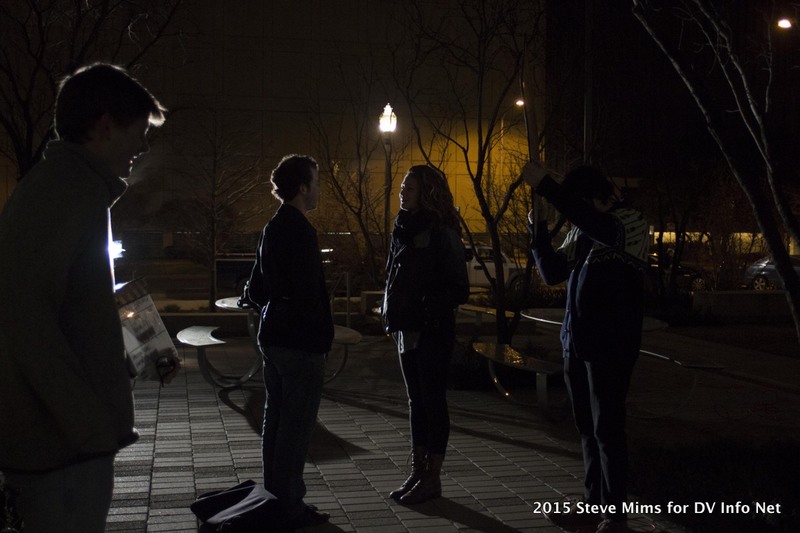 For the exterior set up we used an Arri 650 Fresnel for a backlight. But basically, we wanted to try the camera in existing light with wide open lenses, bumping the ISO up as needed for exposure. You’ll see a bit of grain in this footage at ISO 8000. 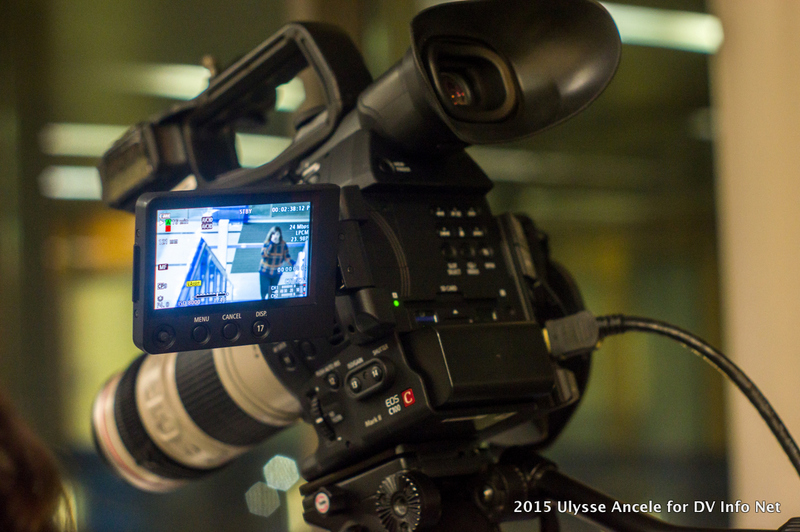 I was impressed with the OLED screen which the AC was able to use to judge follow-focus on the 70-200mm lens. Overall the footage has a natural grain that is more pronounced than ISO 850, but not objectionable for existing light. Both clips were shot in Canon Log. The second half of each piece is graded with Tiffen DFX using their Kodachrome 25 look. The VIEWFINDER is arguably the one that should have been on the first camera. It’s a pleasure to use: angle-adjustable, bright, sharp and shielded by a real eyecup. The OLED screen is now sharp enough for use by an AC to accurately pull focus and it folds over on the side of the camera where an AC works. Very nice. There’s no more guesswork about critical focus. The C100 Mk. II OLED screen folds in a variety of ways. Here it’s against the body in a perfect position for an A.C. The DIGIC DV4 processor is a huge improvement in terms of reducing noise in the image. And the new Canon lenses are sharp. I especially loved the EF-S 10-18mm, which fills a real need for an affordable, flexible ultra-wide angle lens when using a Super 35 sensor. Sure, it is a slow lens… only f/4.5 at its widest focal length. However, it’s practically rectilinear with no apparent barrel distortion, it’s image stabilized, and it’s STM which is ideal for video. Best of all, it’s only $300. The EF 24-105mm f/3.5-5.6 IS STM is not an L-series constant aperture zoom like its older brother, the EF 24-105mm f/4 L IS. Despite that it’s still very sharp, and it’s better suited for video than the f/4L version because it’s an STM lens. It’s well known that the f/4L puts out a significant amount of motor noise when the image stabilizer is switched on. That problem is eliminated on the super-silent 24-105 STM version, which is almost 50% less expensive than the f/4L. 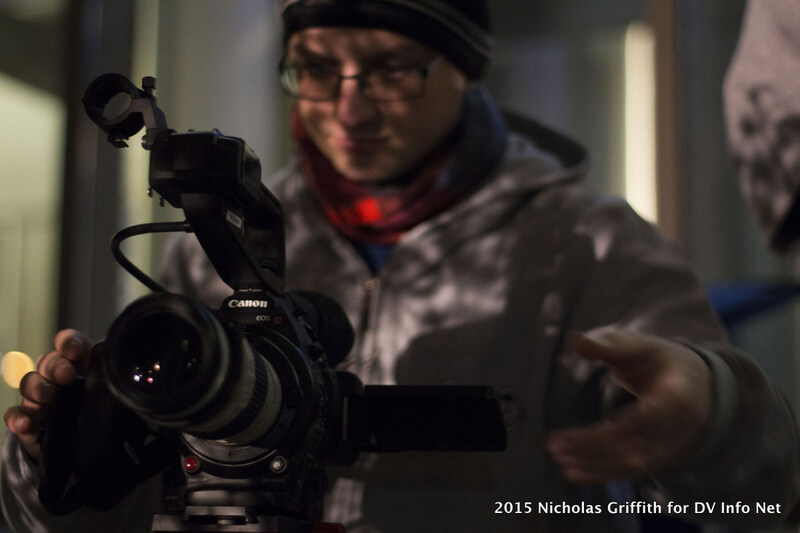 Marek Mlocek with the C100 Mark II and the 70-200mm outside the Belo building at UT-Austin. The Canon C100 Mark II is a remarkable camera. I’ve been very happy with the results from it’s predecessor, but this revision addresses the shortcomings that made the previous version very good but less than perfect. It stands out among other cameras as great engineering in an elegant, ergonomic, low profile design that delivers without complaint. The range of usable ISO settings remains the most radical innovation in the Canon line, and that has changed the way I light and shoot beyond anything else. It is an amazingly well thought-out blend of engineering and design offered at a rational price. This scene is backlit with an Arri 650. I’ve yet to need to deliver a 4K project. Effects shots are another matter, but I can make arrangements for a few days of green screen work. To put the 4K issue in perspective: my favorite movie theater in the world, the Violet Crown Cinema in Austin, where every seat is within fifty feet of their 300-inch screens, uses 2K projection (like most contemporary cinemas) and it looks great. Up-resing material shot in HD to a 2K DCP involves only a slight enlargement of the frame. So I don’t have any problem shooting 1080p, even if the final product is destined for a large screen, now or in the future. The last feature doc I worked on was shot in XDCAM and on Canon DSLRs, and the combined footage was mastered as ProRes (HQ). I saw that film projected on giant screens all over the US and I was always impressed by the way the image held up. One last note about 4K. I go to NAB almost every year. A couple of years ago the buzz was 3D. Then that kind of went away. Now it’s 4K. Sure, its better, but by how much and where can you screen it? How many projects will be needing 4K for theatrical presentation? Broadcasting was only fairly recently retooled for HD. When will 4K become a broadcast requirement? As an observer of how things have changed over the years, one thing, I would say, hasn’t changed: the need for manufacturers to sell new stuff. 4K cameras, monitors, projectors and television sets amounts to a great market, when it exists beyond acquisition of high-res footage for compositing special effects. Above: Students and faculty of RTF 366K – Introduction to Narrative, The University of Texas at Austin, Moody College of Communication, Dept. of Radio-Television-Film, Spring 2015. Back row: Ulysse Ancele, Joe Birch, Nick Griffith, Pat Murphy, Andreal Lopez Leal, Paul Judah, Derek Allison, Katherine Horak, Molly Flynn, Seth Beaugh. Front row: Steve Mims, Katherine Williams, Marek Miocek, George Sayah and Neha Aziz. The class explores the expressive potential of sound and image through the production of digital video and 16mm exercises and short films. 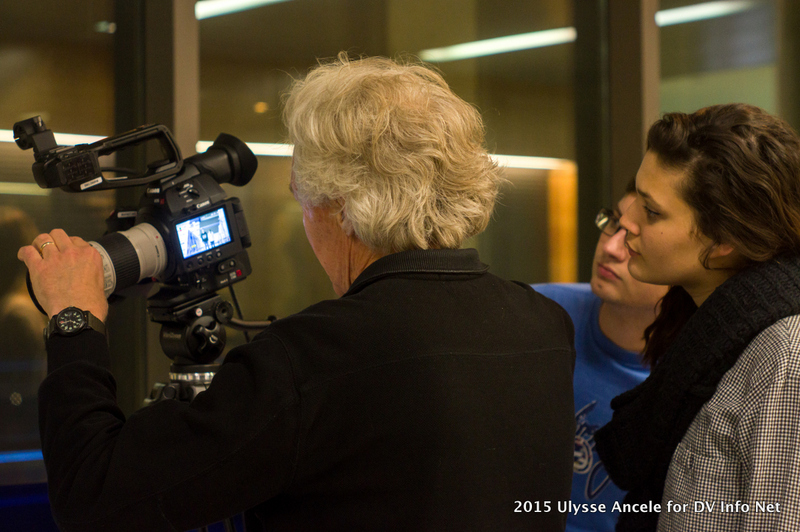 It is an intensive workshop in visual storytelling and non-dialogue filmmaking. 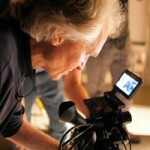 It is designed to build upon the fundamental production concepts and techniques that were introduced in RTF 318 and to prepare students for the advanced narrative classes. Photo by Jason Outenreath. A Note from DV Info Net: The camera and lenses mentioned in this article can be bought from our trusted site sponsor, B&H Photo Video. Purchases made through the following affiliate links help to sustain this site. Thank you in advance for your consideration.